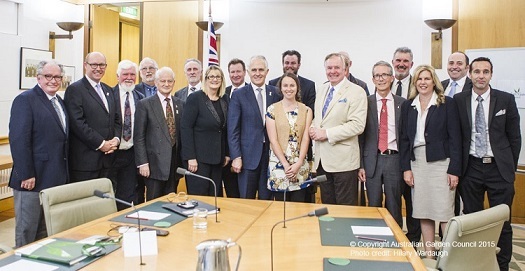 The Australian Garden Council was launched at Parliament House in Canberra, on November 25th 2015, prompted by a number of federal MP's to promote gardening and gardens across the nation. The profile of gardening has been too low for too long. Until November 2015, gardening had not been mentioned in our national parliament for more than 25 years, despite being a more popular pastime than anything else across the country. On its formation the committee of 13 heard of many problems and opportunities in the garden industry. Garden tourism is a massive global industry (300 million tourists), but one that Australia has yet to tap into. Fantastic career and business opportunities exist for young people in gardening; but all too often, school leavers are simply unaware of these possibilities. The Prime Minister. Malcolm Turnbull, told those present of the need to encourage more Australians, particularly in inner city areas, to get gardening. The health benefits alone are huge. psychological and physical health at the same time. There is also a wonderful opportunity for us to grow our garden industry, expanding garden tourism, education and exports of all sorts.